1 of 5 In a large microwave-safe bowl, combine milk, sugar, eggs, cornstarch and salt. Whisk until well blended. 2 of 5 Microwave, uncovered, on HIGH for 5 minutes. Whisk until smooth. 3 of 5 In second bowl, melt chocolate on HIGH for 1 minute. Stir. Microwave on HIGH another 30 seconds. Stir until smooth. Whisk chocolate and almond extract into milk mixture until smooth. 4 of 5 Spoon into 4 serving dishes, cover and refrigerate for at least 4 hours. 5 of 5 Just before serving, toast almonds. Place nuts in a glass pie plate. Toss with olive oil. Microwave, uncovered, for 1 minute on HIGH. Stir. Microwave an additional minute or until lightly toasted. 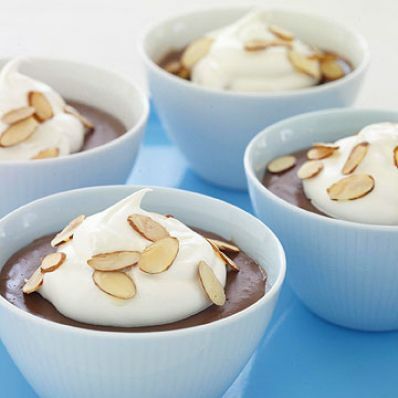 Garnish puddings with whipped topping, then sprinkle with toasted nuts.